craftseekers.com is a website directory for the craft industry. It allows visitors to sign up and add their own website to the directory. Registered members can upload up to 20 images to help showcase their website and services. It also features a forum. The entire website was built from scratch. All of our websites are fully on-page optimized for search engines. We also provide a resource directory to allow our clients to increase their link popularity. It translates to better rankings for their own sites. 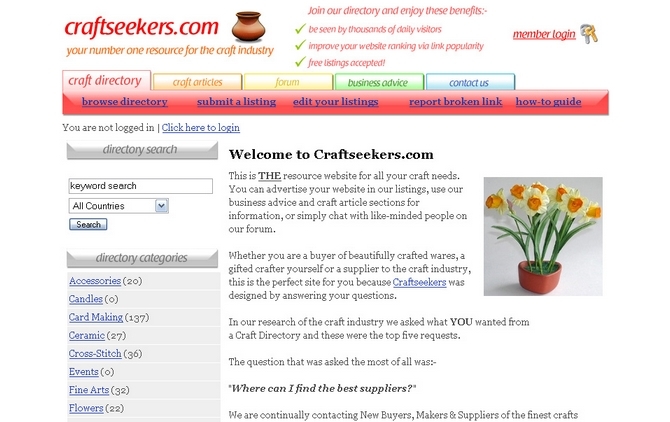 Below is a small random sample of some recent searches made by people to find craftseekers.com.